with 6 weeks of water changes and removal of all dead skeletons, etc, the nitrates are down to 70-80ppm and falling. 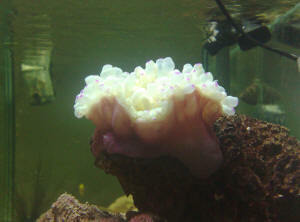 My mother, bless her, purchased a Bubble Tipped Anemone for the tank without my prior knowledge. The plan was to be stabilise the tank and then start with the new inhabitants....but alas I don't know what to do. I have placed it high in the tank and have not removed it from the rock it was purchased on. I have set up a 30gal quarantine tank (it is only 24hrs old, seeded with substrate and a very small amount of water from the large tank) and would like to know if you recommend leaving the anemone where it is, move it to an un-cycled QT or return it to LFS? I am turkey-baster-feeding it brine shrimp and It is reacting ok, but during feeding and at night its mouth appears quite slack and I am worried about the colour - could you please comment? <Yes, do read here and related articles/FAQ's. Attached is a photo of the anemone and the tank for size reference, although the anemone was not in it at the time of photo. Thank you, and sorry for the short story! I have a question about quarantining an anemone. My quarantine tank is not setup (lighting wise) for an anemone, because I have a FOWLR setup. I've never needed strong lighting. I only wish to keep anemone's in the system long term, therefore the display tank has been setup for anemones. 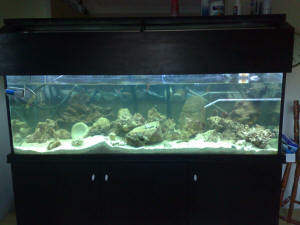 I have a 150 gallon high tank with 0 nitrite and ammonia, and .05 nitrate. I have 500 watts of MH (14K), 1 96 watt t5 (20K), and 1 96 watt (10K). The sand bed is 6-7 inches, the system has been established for one year. I have a 50 gallon refugium with Chaetomorpha, and live rock in it. There is approximately 130 lbs. Of live rock in the system. All the inhabitants are reef safe with the possible exception of a 5 in. Blue angel which hasn't been tested yet. I also have 2 other tanks if something goes after the anemone, I can the fish. I am mainly concerned about quarantining the water the anemone is in than the anemone itself due to ich and other possible bacterium/viruses which may inhabit the water. Any suggestions? Does the anemone not need light on a daily basis while in quarantine? I love this site, thank you for what you do. I have (1) yellow Sebae Anemone (1) purple tip Sebae and (1) Rose Anemone set up in (2) tanks (1tank) a 90 gal. And (1tank) 30 gal ,plumbed together. The yellow and purple tip is housed in the (30gal. tank).The yellow Sebae use to be bright yellow and opened to approximately 8" around .For the last 2 months it is not opening as large and now its color is very pale yellow and some of its tentacles are even showing some light brown to it. The purple tip has no color lost but it is only opening a 1/4 of it size (normally 10" around). 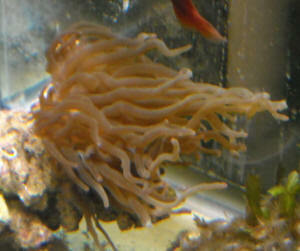 The Rose Anemone is in the main (90gal.tank) seems to be fine. I changed my lighting about 1 1/2 month ago from Coralife (2) actinic and (2) 10,000 t-5 to Aqua traders, a 10,000k 150 watt fixture with (2) actinic in hopes that better lighting would help. with (1) krill each and alternate with 1/2 of a silver side for each anemone. water parameter- phos-20ppm, nitrate-10 to 20 ppm, cal. KH, and pH and temp. are all within range. <Your high phosphate level is contributing to your red slime problem, and I'd try to keep the nitrates under 10ppm. all other tank inhabitants are normal ( Leather Coral, Colt Coral, Birds Nest, Bubble Coral and fish are all normal. I have the (2) tanks on reverse lighting periods. I am dosing Vodka at 3ml. a day for the whole system as they are plumbed together. I have some red slime algae on the back wall of the 30gal tank. Water movement and flow is good. please advise if anyone has any suggestions. <The majority of all anemone specimens sold in the trade don't even live a few months... Major reasons are poor collection, processing, shipping/handling, and likely an equal amount due to being placed in a poor environment by dealers. Heteractis Crispa (Sebae Anemone) is difficult to keep for any length of time even under the best conditions for reasons stated above. Do read/learn more about these Cnidarians here. Hi I sent you guys a question earlier this morning about my bubble tip anemone problems. I sent a picture of him, and listed all water and lighting other livestock etc. I did not mention the other corals in my tank. I have been reading on your site all day and I'm wondering if the brown, gold, and green Zoanthids in my tank could be the problem. If the Zoanthids are the problem, should I get rid of them. Our tank has been set up for a long time and they have multiplied a lot. Will my BTA survive? What's the easiest way to get rid of them? Thanks. Dawn D.
Hi Crew. Thanks in advance for your help. I am needing some help with my bubble tip anemone. I purchased him at my LFS about 2 months ago. I am in the process of trying to correctly identify him using your web site, but when I got him he had beautiful frosty bulbs with purple on the tips. He was fine, behaving and eating as I would expect based on the research I've done about them. About a month ago we replaced the bulbs in our aquarium. Compact fluorescents 2 each of 65w dual actinics and 2 each of 10,000K dual daylights. Our tank is a 90 gallon with a 15 gallon sump. No mechanical filtration. 6 inches live sand, 110 lbs live rock, a pro clear aquatics 150 protein skimmer in the sump, and a pacific coast imports chiller that keeps the temperature at a constant 78. specific gravity is always 1.024 with water that has evaporated replaced each day with RO water from a Kent RO unit. We do weekly 10% water changes. Calcium is about 400, PH is 8.2-8.3. no ammonia etc. alkalinity is on the high side of normal according to my test kit. The aquarium has been set up for over 3 years. This is the first time adding a BTA. Also I change a carbon pillow monthly in the sump. We have four ocellaris clowns, one desjardinii tang, one regal tang, one yellow tang, a coral beauty, and a male and female mandarin dragonet. Also a lot of snails, some hermit crabs a couple cucumbers a skunk cleaner shrimp and two red fire cleaner shrimp. Anyway, since we replaced the light bulbs, our BTA has not been well. His color on his body is still the same, brown, but his tentacles have shrunken more and more until they are almost gone. He still eats and excretes waste. I feed PE mysis shrimp mixed with Cyclopeeze and formula two flakes daily to all tank inhabitants, and I feed small chunks of shrimp and scallops from my local grocery store to the BTA every few days. Usually he takes it. Occasionally he lets it go. Are the lights the problem? He is attached to a large rock that can be moved lower in the tank. I am attaching a photo that I took of him this morning. At night when the lights are out his disk expands like a big soft pillow full of water, about 4 or 5 inches across, but the bulbs still stay shrunken. His mouth is tight and smooth. Can you guys(and or girls) help? Thank you so much. I love your site! Love the site, certainly one of the best online!! Now I recently acquired an Anemone with a setup I bought, has a Tomato clown currently hosting. I've been keeping them in my frag tank, since I tried an Anemone before and not much luck. Needless to say I'm gun shy about putting in my main tank. The way he looks in this picture only scares me more. First of all my lights 250 MH new 10k bulb, Tank is 45 Gal corner hex, Amiracle wet dry, live rock instead of bio balls, Berlin 60 protein skimmer. In the evening about 5 hours into the light cycle, it shrinks up, recently started showing his innards, see picture. One pic is taken today deflated, mouth exposed, other is normal pic taken about two weeks ago. In the morning, he is back out puffed up with water as it should be. I've had it about a month, has eaten krill pieces, plankton, silverside pieces, and anything I feed the fish and corals. Is this normal? By the way, can you identify it as well? Thanks for the helpful/wealth of information. The Anemone is currently under the 250W Metal Halide lighting. Is it normal for them to deflate? I did notice when lights out with just the moon lights, it came inflated back up to normal within about an hour. Looked great. This seems like a stupid question, but could the light be too much? I'm going to remove the Clown as well, maybe that is the issue. 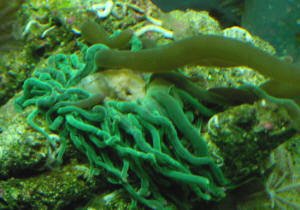 <Yes, does not belong with this anemone. Do read here and related articles/FAQ's on light acclimation. I added a clownfish and anenome <anemone> over the weekend, and after 2 days, the clownfish has been really swimming hard in the anenome. Last night, the tentacles in the anenome have gone inward and the foot/stem is laying on it's side...but tentacles are still moving. I think the anenome <anemone> may be dying from all the rough treatment from the clownfish. <I'm going to forward this to Sylvia Browne, maybe she can help me with useful information I need to attempt to answer this, such as, tank size, water parameters, lighting, filtration, tankmates, etc. Please provide. ...trickle sump filtration.....water test done a few days ago...prior to adding fish....all levels OK.
<Is natural for the clown to do this. Better to keep the clown separated until the anemone acclimates and attaches. What kind of anemone is it? Might be better for you to read here and related articles/FAQ's. Here's a photo of my anenome with the clown nearby. The lighting was recommended by a trusted professional who set up my tank. He is very knowledgeable. Please advise. I love my anenome, and don't want to lose him. <I did advise, re-read below. I never get a straight answer from you as to my questions in this thread, all I hear "is by a trusted/knowledgeable professional". If that's the case, why are you writing? Since you will not tell me about your lighting system other than was recommended by a trusted professional, I will tell you that anemones are shallow water photosynthetic invertebrates. They all require bright lighting to survive. A few species (E. quadricolor, S. haddoni) can thrive under bright VHO lighting, but for the most part, all require bright lighting including metal halide/HQI, to survive, especially the Condylactis anemone which is what you have. "I was in the wrong place"
but it must have been the right time".... This Premnas needs to be separated from the Anemone. Sorry to bother you....my professional recommended this website as a place to get excellent info/answer questions about marine aquariums....He is out of town this week, and I wanted immediate help on my problem. I will not bother you any further. <Is not a problem, we were trying to help you, but got little in the way of needed/asked for info. How is that done? Take the anemone out and place him in the sump tank? Thank you for your patience with my many questions...this is my first tank and I don't want to make any mistakes. The lighting is 4 lights...white and blue which I have on a timer. The anemone started to look bad when the clownfish pushed it up against a live rock, and acted aggressive toward it. The experts at the place where I bought everything said the clownfish is just playing...no problem, but I disagree. <Is normal behavior for the clown, problem is, the Condylactis are not hosting anemones, and is the reason the anemone needs to go, for it's own welfare. Being you are new to the hobby and this is your first tank, be forewarned that anemones are not a good beginner invertebrate. They are difficult to keep for any length of time even for experienced hobbyists. Thanks for all your help and advice...much appreciated.